Read this and weep. New York Times story about Goldman Sachs’s so called settlement for their actions that helped to ruin the lives of millions of ordinary people across the country and the globe. 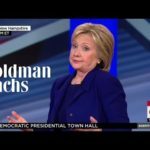 Hillary Clinton made more than $600,000 in talks to Goldman Sachs. I don’t think she was telling them to pony up to atone for their greed. Plus, they have contributed more than $800,000 to her campaign. I know a lot of women — particularly older women — who are for Hillary, not because they love her or her politics but because they want to see a woman in the White House before they leave this earth. I would also love to see a woman in the White House. The question is, which woman? Margaret Thatcher — the woman who famously proclaimed that “There is no such thing as society: there are individual men and women, and there are families,”— was a woman. Indira Gandhi was a woman. Were they good for the UK or India? I would rather have a man in office who did great things for all the people than a woman in office who only helps the rich get richer and who sugar coats her support for our oligarchs with speeches about women’s rights. For more on Clinton and her approach to women and inequality see this article in Harper’s.